The official site of the Progress Residents' Association (PRA), for the Progress Estate, Eltham, London, SE9. The Progress Estate was built in 1915 to house the workers from the local Woolwich Arsenal munitions factory, for the First World War. Progress Residents' Association needs you! social event planning, developing publicity, contributing to the newsletter and monitoring proposed developments within the estate. If you would like further information and you are over 18 years of age and live in Progress Estate, please express your interest via email to theprogressestate@gmail.com or text 07852 888992 providing your details and the best way to contact you. Matters Residents wish to be considered at the AGM are called Resolutions. These include nominations for people to serve as Committee members, which must be seconded by a Resident who is present at the meeting. Resolutions will be passed if a majority of Residents voting, vote in favour. Resolutions must be in writing and be received no later than 7 days before the AGM. They should be sent to the Secretary, Kirsty McGrath, ideally by email to theprogressestate@gmail.com by 1st December, 2018. Those without access to email should call 07852 888 992 to be told the address to which they should write their resolution to. Letters must be received by the 1st December 2018, so please allow time for postage. You must include your name and address in your email or letter. a) To represent the views and interests of all Residents in appropriate forums be these recognised organisations, groupings or otherwise. b) To promote and encourage a sense of community amongst Residents. c) To monitor proposed alterations to, developments on and maintenance of the Estate with a view to ensuring they are in keeping with its designation as a Conservation Area covered by an Article 4 Direction. d) To exercise influence to ensure, insofar as is possible, that Residents receive the best possible housing, environmental and community-related services. The Associations activities for the year are included in this newsletter. If you would like further information regarding the annual reports please contact the Secretary, Kirsty McGrath, ideally by email to theprogressestate@gmail.com by 1st December, 2018. Those without access to email should call 07852 888992 providing their name and address for a copy of the reports to be addressed to. What have the Association been doing to support the Aims? We published our book The Origins and Evolution of the Progress Estate, Eltham’s Garden Suburb in July, 2017. By the end of October this year, 163 copies had been purchased by people living on our Estate at £10 each and 103 by others living elsewhere in SE9 for whom the price was £12 a copy. A further 75 had been sold to addresses elsewhere in the UK at the cover price of £13.95 a copy. Copies remain available and may be ordered by email from keith.billinghurst@btinternet.com or by calling or sending a text to 07962 877389. Please provide your house number, road name, postcode and phone number. During the 12 months to the end of August 2018 (Land Registry data is published approximately 5 weeks after the end of each month) 32 houses changed ownership, 7 less than in the preceding 12 months. Welcome letters have been delivered to all these new owners. Unfortunately The Hyde Group ceased to provide us with the addresses of residents moving into their properties following a reorganisation near the beginning of the year and, despite requests from ourselves, have ceased to provide us with this information. We would therefore like to take this opportunity of welcoming all Hyde residents who have moved to our Estate during 2018. Our meeting in July to highlight parking problems on the estate was well attended and the committee is working through the various problems and their solutions with the different agencies involved. 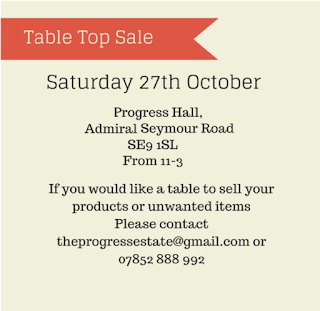 The table top sale in October had 18 different stall holders from local people with varying items for sale. We were a little disappointed with attendance, but those that came enjoyed themselves and bought some bargains. • Youtube - search "Progress Estate"
Our website, www.progressestate.co.uk continues to be popular with 81,500 views since launch of which 994 views were in of September. Our 210 articles cover the history of the estate and roads (with photos), planning permission guidelines, tradesman directory, news and updates. We are always looking for old photos of the Estate to add to our "roads" pages. If you have any and are happy to share them with us (you will be credited) please let us know. Finally, if you would like to receive future newsletters and updates via email, please send an email to theprogressestate@gmail.com with the subject ‘Email list’. With each new year, we often make resolutions with an aim to change and improve ourselves. The Progress Estate Residents Association often hears about the acts of neighbourliness that are in support of our aim to create, promote and encourage a sense of community within the estate. Studies show that by performing even one random act of kindness, not only can make another person’s day but also your own, whether its asking if they would like a hand with some gardening or saying hello. We would love to hear more of any acts of neighbourliness to share in future newsletters or on our website, please send them to us via email to theprogressestate@gmail.com or via text to 07852 888992. We currently have vacancies on our committee for new members to help support the Association in meeting its aims. Taking on tasks as they arise such as responding to planning consultations, highways issues, dealing with The Hyde Group over matters such as the management of the communal gardens along Well Hall Road and elsewhere on our Estate and, recently, liaising with JDT Utilities who have been installing new gas pipes as contractors to Southern Gas Network. Because some of these tasks often involve daytime meetings, ideally we be interested in persons who have recently retired or whose family have reached the age of independence. 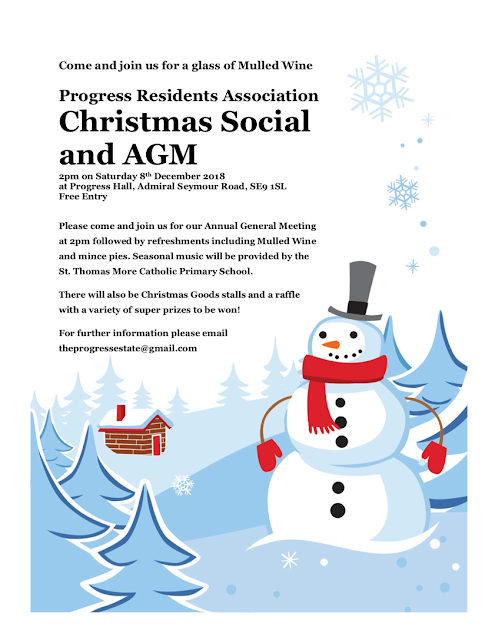 The Progress Estate Residents Association Committee look forward to seeing you at the Christmas Social and AGM on Saturday 8th December at 2pm and wish all the Estate’s Residents a Merry Christmas and a Happy New Year. Making Progress is published by the Progress Residents Association. Have our emails stopped arriving in your inbox? At the time we created our list, emails were sent from a spreadsheet we maintained ourselves. After not very long, Gmail's approach to emails caused us to move to MailChimp, a provider now used by many organisations. We used to write to people whose emails were undelivered. Almost invariably, the reason why the email bounced, was they had changed their email addresses and they happily gave us their new one. Because individuals' right to unsubscribe has heightened importance under General Data Protection Regulations (GDPR), we are no longer told of non-deliveries so cannot write to people as we used to. If therefore you change your email address, please write to theprogressestate@gmail.com from your new address and put 'new email address' in as the subject. We will then add your new address to our list. Did you know that we have a list of recommended tradesmen and companies on our website here? 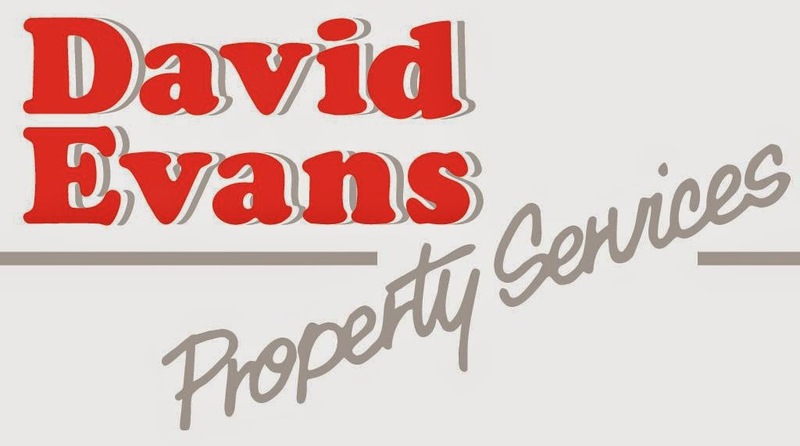 References are from past or current residents, resulting in each tradesman or company being added to the list. If you would like to recommend a tradesman or company please email us at theprogressestate@gmail.com, telling us their trade, how to best contact them, the work that they did and when this was. It is not illegal to park on pavements, provided pedestrians can continue to walk past them on the pavement. If a parked vehicle stops pedestrians using the pavement the matter should be reported to the non-emergency police telephone number, 101. If residents believe vehicles are breaking the speed limit, they should report the matter to the same police number. Teams will ask for the name of the road (and in the case of long roads, the relevant part) and the time and days the speeding occurs. Double-parking blocking the road should also be reported to 101. Bins that are left blocking the pavement after they have been emptied should be reported to contact-centre@royalgreenwich.gov.uk or by phone to 020 8921 4411 and, whether emailing or phoning, residents should specify they are reporting anti-social behaviour. When a large delivery is expected, or space needs to be reserved for a removal lorry, residents using bins to reserve a space are asked to display a note explaining what is expected, and when. I am stepping back into the post of Chair for this year and thank Margaret Oliver for her carrying out the role last year so well. Our Christmas Social was a great success and we all enjoyed the afternoon with the very professional singing of the choir from St. Thomas More Catholic Primary School. The committee had a brainstorming session at the end of January to try and find new and/or more effective ways to represent and communicate with our residents. This is an ongoing feature for this year and so we ask your patience as we try and get to grips with these ideas. We currently have a committee member vacancy to liaise with Royal Greenwich on planning and enforcement issues. This role would involve bi-monthly meetings at The Woolwich Centre as well as liaison with the planning application committee member. The position might be ideal for someone who has recently given up full-time work and who is interested in helping to maintain the architectural integrity of the Progress Estate Conservation Area. If you would like to learn more about this position, please write to theprogressestate@gmail.com. Both the North and West areas of the estate have a committee member representing the residents at meetings. These members will report any non-urgent concerns of yours at their next quarterly meeting but we do advise you to contact the police asap if you are concerned about your’s or a neighbours safety. Would you be interested in an organised coach trip to a place of interest or to the coast? If you are, could you please contact us so we can see if this is a viable option. As most residents will know, new supplies of the slates used to roof some of the houses on our estate ceased to be quarried some decades ago. This issue came to a head last year when works were undertaken to certain properties in Ross Way and Whinyates Road. When making their planning applications, the owners of the properties implied that high proportions of the slates would be re-used yet, in the event, all were replaced with new tiles. 1. Applicants will be required to include an estimate of the minimum percentage of the original slates that they expect to incorporate in replacement roofs and fascias. 2. Applicants will be required to specify that, where estimated recovery rates are below 100%, the entirety of the front roof will be re-laid in original tiles and to specify a suitable new tile to be used to fill the shortfall at the rear. This would normally be expected to be green Brazilian slates, in line with the Progress Estate Conservation Area Character Appraisal. 3. In assessing proposals, planning officers will have regard to the guidance within the Progress Estate Conservation Area Character Appraisal that a minimum recovery rate of 80-90% should be possible. Where estimated recovery rates are below this benchmark, the applicant will be required to provide a robust justification for why a higher recovery rate is not considered possible. 4. Where permission is granted, a condition will require the proposals to be implemented fully in accordance with the approved plans and accompanying documents. This approach will provide an effective means of enforcing against any breach of permission as the minimum retention rate will have been clearly specified in the application for planning. The Government has confirmed that all services on the Bexleyheath Line to Victoria will be cut after the new franchise is awarded in 2018, despite the Government’s own consultation showing that 89% of respondents were opposed to plans to cut the number of local rail destinations. Until such time as Lewisham station is thoroughly modernised, cutting this service from Eltham and elsewhere would be a disaster for commuters, in particular for those who rely on the rail network as an accessible route to Kings College Hospital at Denmark Hill. To get in touch with us to let us know what you would like us to be doing for you. Whether you have an idea for a residents event or feedback about the newsletter or our previous events then we want to hear from you. The Progress Residents Association will take all reasonable steps to safeguard and preserve the privacy of all those who contact details are held on its email list. We will update this Policy if and when circumstances make it desirable. Information about your use of our site including anonymous details of your visits such as pages viewed and the resources that you access. Such information includes traffic data, location data and other communication data. Information provided voluntarily by you when, for example, you ask to receive information from us. • To provide information to you that you request from us. • To provide information to you relating to other products and services that may be of interest to you. Such additional information will only be provided where you have consented to receive such information. We never give third parties the data we hold about you to enable them to provide you with information regarding unrelated goods or services. In operating our website and email facilities, it may become necessary to transfer data that we collect from you to locations outside of the European Union for processing and storing. By providing your personal data to us, you agree to this transfer, storing and processing. Unfortunately, the sending of information via the internet is not totally secure and on occasion, such information can be intercepted. We cannot guarantee the security of data that you choose to send us electronically; sending such information is entirely at your own risk. We will not disclose your personal information to any other party except where we are legally required by law to do so. A new interactive Children's book for ages 7-11 years. 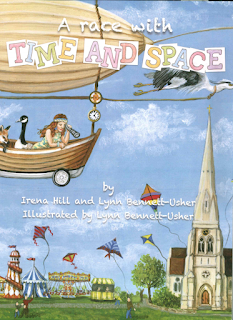 Illustrated by Lynn Bennett- Usher lives on the estate and painted the pictures of "Write home soon" for the Centenary. 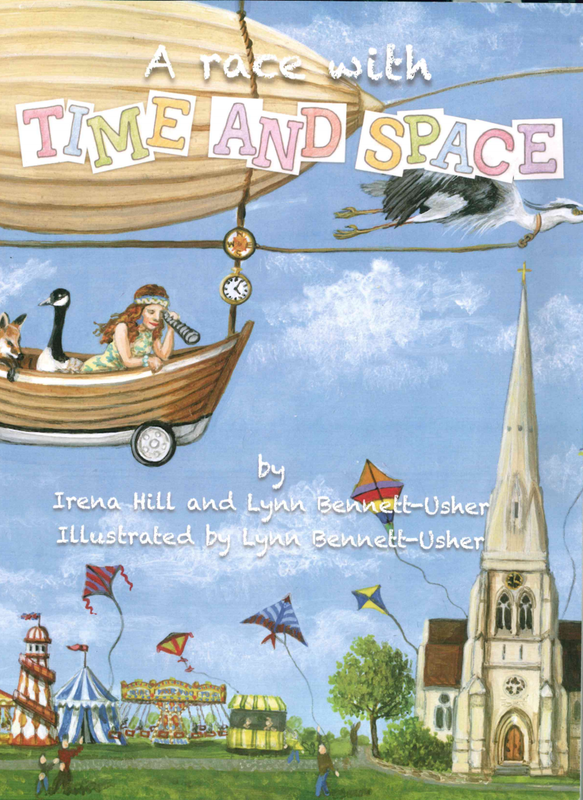 The author Irena Hill lives in Greenwich. This is a book about two sisters travelling on a quest, racing through historical and fun places. During this quest, the children will discover facts about the area they live in, in a fun and imaginative way. The book launch will take place at Eltham Library on 9th December, where the authors will be reading excerpts from the books and explaining more about the concepts. The books are priced at £10 each or £9 each for more than one. Archery Road, SE9 1HA on 9th December at 1:30 p.m. where Lynn and Irena will be reading excerpts and explaining more about its concept. It is priced at £10 for a single copy or £9 for two or more. 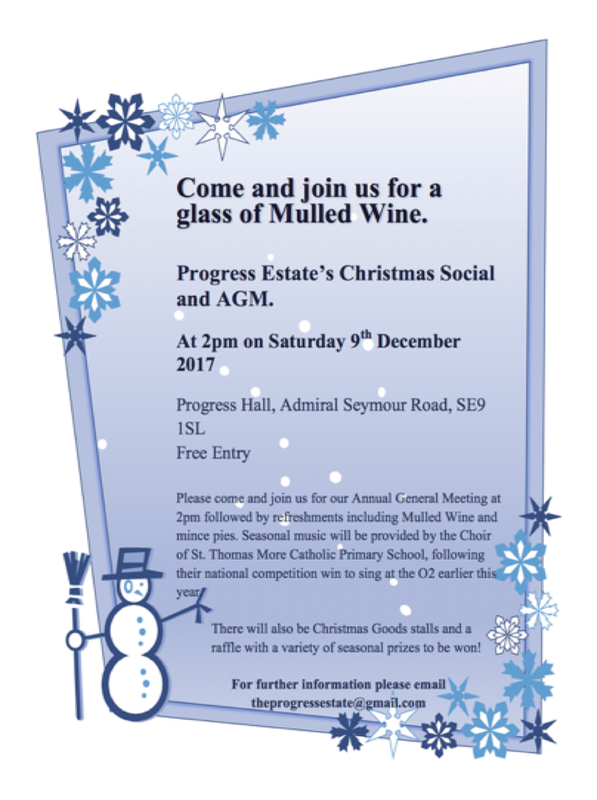 It will also be available during the Progress Residents Association’s Christmas Social which will be held in the Progress Hall, Admiral Seymour Road, SE9 1SL on 9th December 2017 from 2:00 to 4:00 p.m.
Join us for a glass of Mulled Wine at the Progress Estate's Christmas Social and AGM at 2pm on Saturday 9th December at the Progress Hall, Admiral Seymour Road. Seasonal music will be provided by the Choir of St. Thomas Moore Catholic Primary School. There will also be Christmas Goods stalls and a raffle with a variety of seasonal prizes to be won. Phew, the Progress Residents Association has managed to survive another year. This has been a mixed year – three Committee Members, Lynn, Martin and Rui, left due to other personal commitments and I would like to thank all three of them for their valuable contributions. Thankfully we were able to replace them with Kirsty, Philippa and Jimmie - some much needed new blood. We have managed, with a struggle, to persuade Hyde Housing to continue with their small annual grant to us which enables us to hire the Progress Hall for any events we may hold. We monitor the Estate’s planning applications to the Council, keep an eye on conservation matters and we send representatives to other local bodies such as the South Greenwich Forum and the local Police Panels so that we remain in touch with local matters. We had our first attempt at an “antiques/collectables” event early in the year and we have recently held a very successful Race Night. 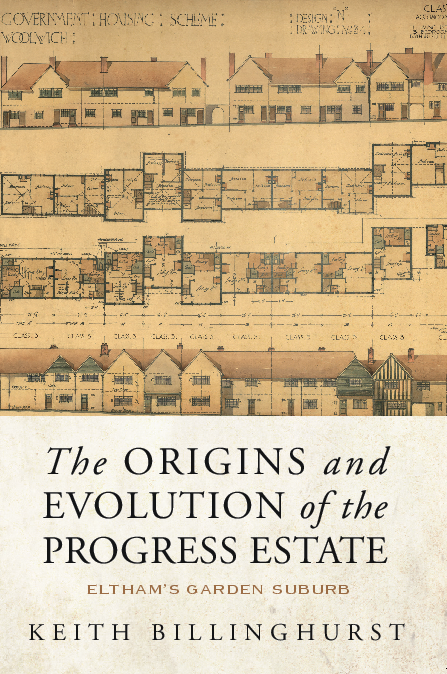 The summer also saw the publication of a book to celebrate the Estate’s centenary in 2015 “The Origins and Evolution of the Progress Estate” a labour of love by one of our committee members, Keith Billinghurst, and the sales so far have been very encouraging. 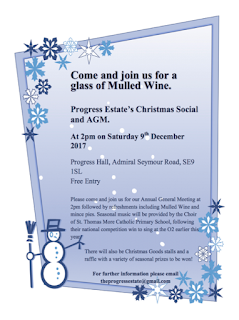 We will be holding our Xmas Social on Saturday 9th December at 2 p.m, by necessity preceded by a very brief Annual General Meeting. It should be fun and I urge you to attend - even if you can only spare the time for a brief visit it would be lovely to see you. Do remember, it is your Association and we represent you. Come to our events; let us know what you think – good or bad; volunteer to help your committee if it is at all possible. Finally, I would like to thank all our Committee Members for giving up their time and energy in an attempt to retain a sense of community on this Estate and to thank all of you who support us by attending events and to thank in anticipation all those residents who will be making a new year’s resolution to support the Progress Residents Association. Wishing you all a very Happy Christmas and a peaceful and successful 2018. The Associations activities for the year are included in this newsletter. If you would like further information regarding the annual reports please contact the Secretary, Avril Martin, ideally by email to avrilmartin625@btinternet.com by 2nd December 2017. Those without access to email can obtain a copy of the reports by telephoning 07962877389 and providing your name and address. The funds received by the Association in the last year have been from multiple sources; grants, income from the sale of the book “The Origins and Evolution of the Progress Estate” and income from fundraising activities undertaken by committee members. The Association received a grant in the year from Hyde South East Housing for £500. Total income for the 12 months was £2,468 (£3,001 in the period ending September 2016). The main expenditure has been; the hiring of venues, research and publishing costs plus other miscellaneous items and administrative expenses. Total expenditure for the year was £2,406 (£2,508 in the period ending September 2016). Income exceeded expenditure by £62 (£493 in the period ending September 2016). At year-end, the Association’s assets were £1,815. These were cash or cash equivalents. A huge thank you is due to all the volunteers and to the community who continue to show their support through attendance at our events. Our sole concern is whether or not, when judged by reference to the relevant planning and conservation guidelines, the proposed works will have a neutral or positive effect on our Estate. We support those that do and object to those that do not. Where we do have objection we provide a comment detailing them. We do nothing if an application is for works that will not be visible from the Public Highway. These are commonly for the removal of trees in back gardens that are not visible from any public highway or for the construction of rear, single storey extensions behind mid-terrace houses. We supported 24 of the applications received, objected to 8, remained neutral to 2 and made no comment on 6. For reasons beyond our control, we missed the deadline for responding to the remaining 7. The Residents Association published its book The Origins and Evolution of the Progress Estate, Eltham’s Garden Suburb at the end of July, 2017. By the end of September, 123 copies had been purchased by people living on our Estate at £10 each and 52 by others living elsewhere in SE9 for whom the price was £12 a copy. In addition, 17 had been mailed to addresses elsewhere in the UK at an all-in cost of £13.95. Copies remain available and may be ordered by email from keith.billinghurst@btinternet.com or by calling or sending a text to 07962 877389. Please provide your house number, road name, postcode and phone number. During the 12 months to the end of August 2017 (Land Registry data is published approximately 5 weeks after the end of each month) 39 houses changed ownership, 7 less than in the preceding 12 months. New families moved into 24 Hyde homes. We have delivered Welcome letters to all concerned. Our Antique Fair, held early in the year, was a great success with stalls selling everything from china, jewellery and all kinds of memorabilia. We seemed to have a steady stream of people popping in to have a browse or making a purchase and then maybe having a cuppa and a chat, all-in-all a great afternoon. Recently, on 21st October, we had a very successful Race Night but it would have been great to see a few more people. Those who did come along enjoyed it very much, all down to Paul who brought all his equipment, and his sense of fun that kept us on our toes. I think a few of us went home with a few more coppers than we came with. Thank you to all who attended. We’d like to have some feedback on our social events so that we can learn from you what you like and especially, don’t like. Send your comments to our email address. Our website, www.progressestate.co.uk continues to be popular with 70,518 views, of which 918 were in the month of September. Resolutions must be in writing and be received no later than 7 days before the AGM. They should be sent to the Secretary, Avril Martin, ideally by email to avrilmartin625@btinternet.com by 2nd December, 2017. Those without access to email should call 07962877389 to be told the address to which they should write their resolution to. Letters must be received by the 2nd December 2017, so please allow time for postage. You must include your name and address in your email or letter. The Progress Estate Residents Association Committee look forward to seeing you at the Christmas Social and AGM on Saturday 9th December at 2pm and wish all the Estate’s Residents a Merry Christmas and a Happy New Year.